With free trial of GameHouse FunTicket. A, B, A, B, left, right, left, right, up down – BOOM! Ask a gamer, and he’ll be able to tell you about his favorite secret move. At CouponPal, we have a few cheat codes for you to try out of our own. Punch in a GameHouse coupon code and cut the cost of the next title you get from the world’s largest developer, publisher, and distributor of casual games. All work and no play make Jack a dull boy! Inject some fun in your life and play games online at GameHouse.com. GameHouse makes it their mission “to enrich lives through games and experiences that people love to play and share.” And, they’re pretty good at it too! You can choose from hundreds of games to download, play online, run on your smartphone or tablet, and compete in via leading social networks. This is the same company that brought you such entertaining titles as Bayou Blast, Plants vs. Zombies, and the award-winning Delicious. GameHouse rewards their customers. When you join the GameHouse community, you can mix and mingle with other game lovers via their forums, learn about the latest gaming news, and read expert reviews. You can even earn GameHouse coins while playing that you can use to purchase new games! They support both Mac and PC computers, and provide multiple levels of membership to fit your desires. GameHouse has over 1,700 titles including popular tile games, puzzles, brain-teasers, card games, fantasy, adventure, action, and strategy games. Whether you grew up with video games or not, GameHouse designs fun, easy-to-use games for everyone. GameHouse started as a small development studio in Seattle, Washington in 1998. Being online early gave the company a head start on the competition. The company’s first title, Collapse, had been on the market for half a decade before Facebook even launched. Today, GameHouse spreads offices across seven countries and connects players from around the world. At CouponPal, we want your experience online to be as fun as possible. Though we don’t have the resources to design new games for you, we have developed a relationship with GameHouse to bring you their extensive collection at a huge discount. Power up with a GameHouse coupon code and use the money you save to get a few extra games or some coffee to stay up late gaming! Turn your trackpad into a joystick and keyboard into a controller – it’s time to play! 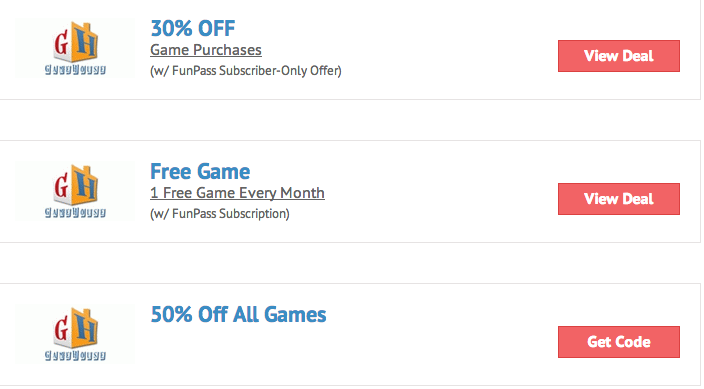 Subscribe today with a GameHouse coupon code from CouponPal and we’ll see you in the game room! GameHouse is an online and mobile gamers dream shop for all things games. 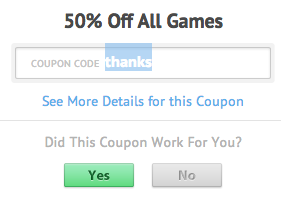 The offers you normally find for gamehouse.com at CouponPal will not require a coupon code to save. Instead, just click "View Deal" on the offer you want and a new gamestop.com page will open with the discount automatically applied to the price at checkout. However, sometimes there will be a coupon code that needs to be entered during the checkout process to activate a discount. For deals with a code, here's a step-by-step guide to make sure you get the most in savings. Once you identify a deal you want, simply click it. This page will automatically redirect to gamehouse.com and a new window with the code will pop open. Highlight and copy the GameHouse coupon code in the new window. You'll need this code at checkout, so keep the window open in case you need to copy the code again. Find the items you want to purchase and click on "Buy Now." You will automatically be directed to a page to confirm your order. Enter the GameHouse Coupon Code at the "Enter a coupon code" field then click "Apply Coupon." Then click on "Check Out." You should see the promotion or discount applied to the price when you get to the checkout window. Confirm the discount, preview your order, and then submit the order. Way, way, cheaper than console games, whose prices have really gotten out of hand. Plus, when you’ve beaten the game or gotten bored with it, then what? At Gamehouse.com, just move on to a different game and it won’t cost you a penny extra. Think you’re going to get bored of all 2500 of their games? Doubtful. Plus, look at this way – use a coupon and the first 14 days are free. After that, there are different membership options if you decide to keep taking advantage of all they have to offer. Play a little, play a lot – up to you. They’ve got your PC Games, they’ve got your Mac Games, your Online Games, your Mobile Games...it’s literally a house of games. The types of games? Those are just the genres listed under the letter “A.” There are 25 more letters of the alphabet. Getting the picture? They’ve got a boatload of games. Maybe you only have a Mac. Maybe just a PC. Maybe you only play on your phone, tablet or iPod. Doesn’t matter, Gamehouse has you covered, wall-to-wall. Some are free, some aren’t. All the ones you’ve heard of are here, plus all the ones you’ll be hearing about tomorrow, too. Can’t speak for you, but the thought of being stuck in an airport (or anywhere) for hours without some games to pass the time make us break out in a cold sweat. What did people used to do? Just sit there and be angry? Don’t buy it? Science would disagree with you. Of course, over-indulging in anything can be bad but study after study show the benefits of video games outweigh the possible negatives. They nurture logical skills, sharpen problem solving skills, increase brain function, improve reflexes, and enhance the ability to concentrate. Oh, and they’re fun, and fun is good for you on many, many levels. Those 2500 games they feature will soon be 2600, then 2700, etc., etc., etc. When will it end? Hopefully, never. Their new Casino game section is insane. Just like being in Vegas minus, well, a lot of things both good and bad. Still, lots to do here. It’s not on the list but another great reason to join is the Gamehouse.com community. Lots of interesting people to play with, lots of interesting reviews and comments, and just a ton of useful info. Now stop reading and get gaming because this is the last sentence of this article.